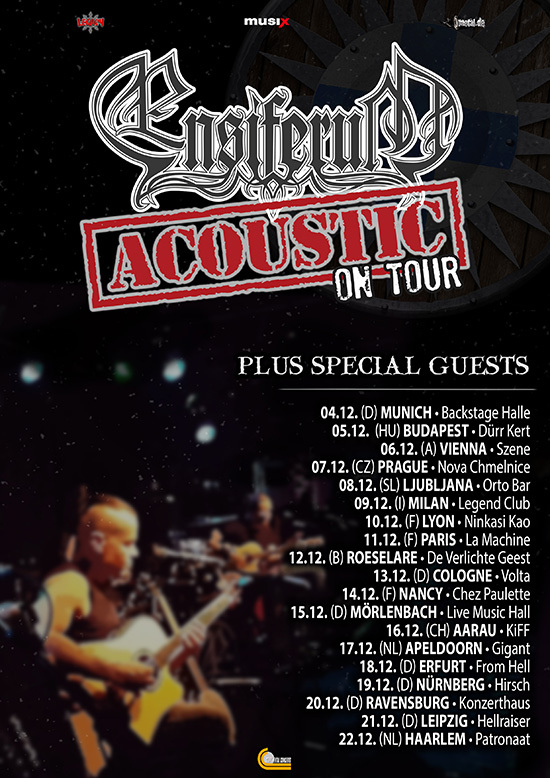 After performing several shows in Finland and recording a bonus “Live” DVD, which is available together with the recent ENSIFERUM album ‘Two Paths‘, released in September 2017 by Metal Blade Records, “ENSIFERUM Acoustic” will present their show for the first time live in Europe. Bassist Sami Hinkka comments: “Hi folks! As some of you might know, we did a bunch of acoustic gigs in Finland back in 2016 and we even recorded the last gig in Helsinki and included that as a bonus DVD for the ‘Two Paths’ album. We had talked about bringing Ensiferum’s acoustic spectacle abroad for years but there was never a proper time for it. This summer airlines lost our gear two times and since we do not want to cancel a show we asked from promoters to arrange us acoustic guitars and we did ex-tempore acoustic gigs on two festivals. We had fun and fans seemed to enjoy them also very much. So, we decided that now the time is right for our first acoustic tour outside of Finland.